Yeah, so definitely not a healthy option today. 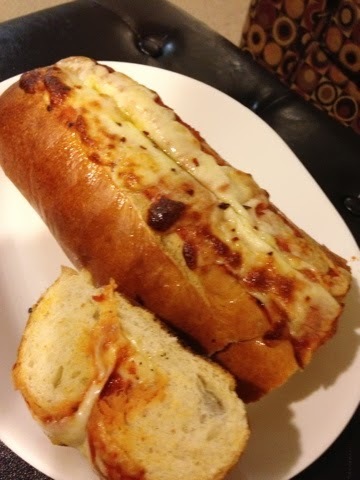 Today, I made a pizza stuffed bread. Another twist on my many takes on the pizza flavors we all love. Who doesn’t like Pizza? Actually, one of my aunts doesn’t. A nice crust, ooey-gooey cheese, and the perfect sauce. Yum! Cut a deep opening on top of the bread, from one end to the other, without cutting the bottom. Open the bread a little so you have room to fill. Take several slices of mozzarella cheese and cut them so they fit in the cut space you are filling. Cubes would obviously be easier but slices is what I had to work with today. Lay the cheese evenly inside the bread, filling the whole length. Sprinkle with black pepper, garlic powder and red pepper flakes. Spoon marinara sauce into the bread then add more of the mozzarella cheese on top. Sprinkle a little bit more garlic and red pepper flakes on top, then drizzle the bread with extra virgin olive oil. Bake in your preheated oven until the cheese is fully melted and the bread is brown and crispy on all sides… which took about 13 minutes for me. I had fresh basil at home and I meant to top the bread with them, but forgot last minute in a rush to get it to the table for iftari.